And I, for one, know how easy it is to get caught up in the chaos of life and forget about what is really important. Last week, I was reminded about how precious life really is. 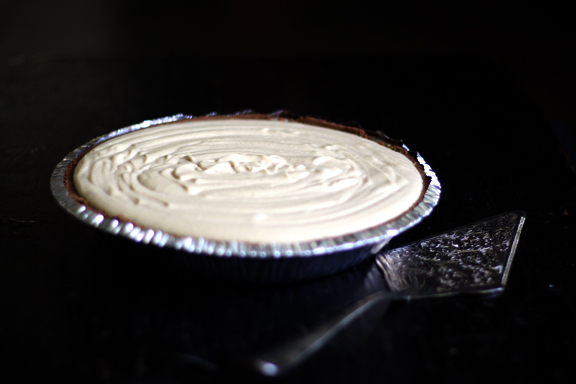 I made Jennie’s Creamy Peanut Butter Pie. 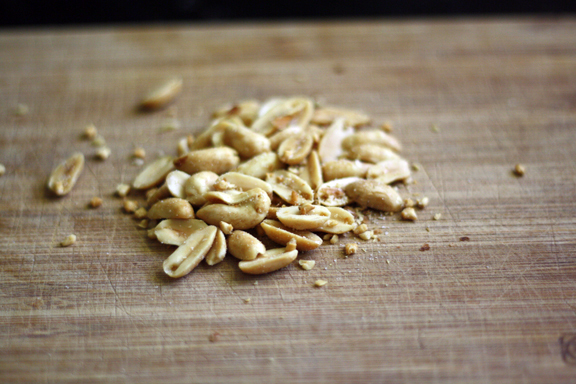 I scrambled for the ingredients and gathered a handful of peanuts and mindlessly began to chop. I was so wrapped up in my thoughts, my fears, my sadness. 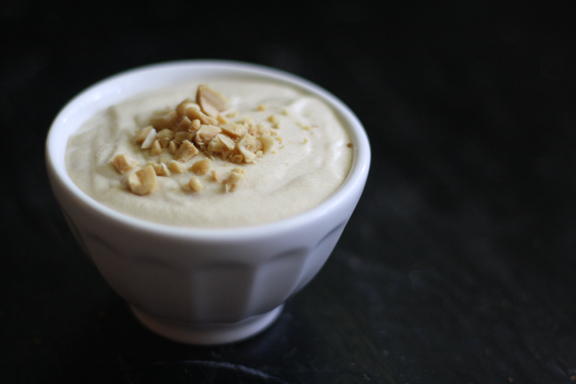 I decided to abandon all good intentions for making a creamy peanut butter pie. Then like a bolt of lightning surging through my body, I realized that what Jennie was asking us to do was love the ones we’re with. 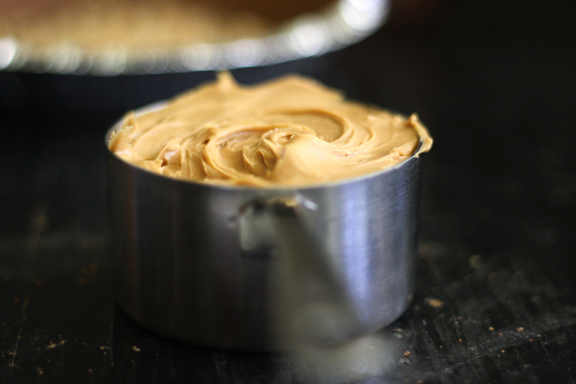 Not to make the perfect creamy peanut butter pie. But to love all who surround you… with all of your heart. Today. This very moment. I melted dark chocolate instead of semisweet. I used a pre-made chocolate cookie crust instead of a homemade one. I embraced the improvisions. And I pondered how life isn’t perfect. How I’m not perfect. How those I love aren’t perfect. But how loving them…fully loving them warts and all…is somehow perfect, especially when faced with the possibility of not having them. I scooped the peanut butter out of the jar and measured it. 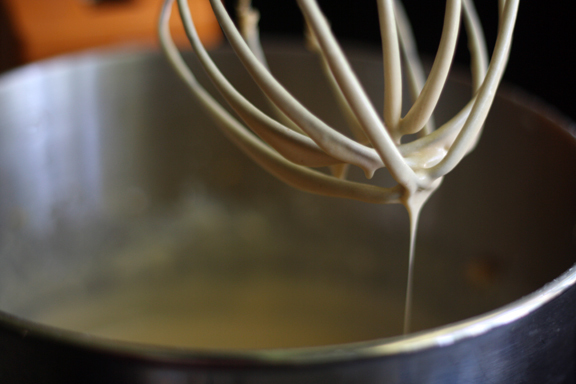 It was sticky and messy and unruly and difficult to measure perfectly. 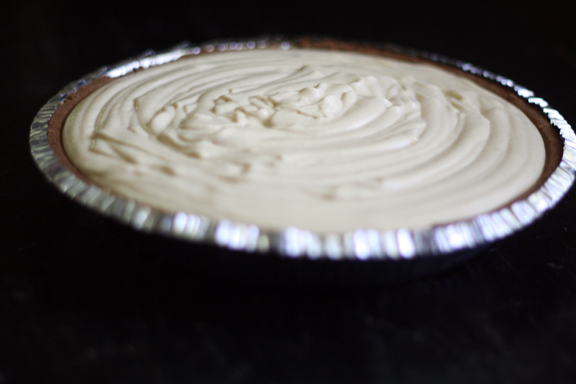 Yet it was intoxicatingly pea-nutty…the very essence of the creamy peanut butter pie that I was making. Instantly I became aware of my unintentional irritation that I was experiencing and focused on the beauty of the sticky, unruly peanut butter. And I thought of the people that I love that can be that way. Sticky. Unruly. Difficult. Probably characteristics that only I notice because I’m that close to them. Intertwined with them. I would desperately miss that imperfection if it was void of my life. So, I focused on the beauty rather than the irritation. 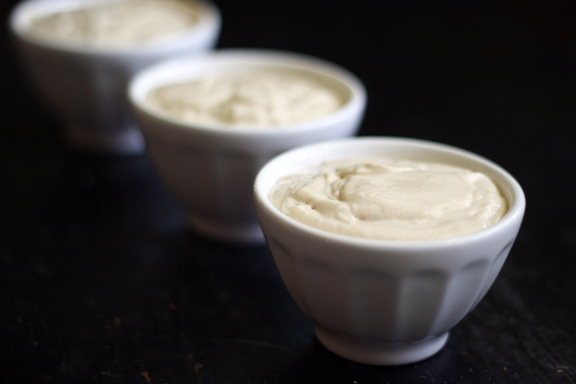 I moved on through the recipe and as I worked I thought and prayed for Jennie and her girls. I prayed for them to be held in the comfort of those who want to help them and comfort them and wrap their arms around them in an acknowledging embrace of their pain. I poured the creamy, soft, peanut butter filling in to the pie shell and made a promise to myself to be more present in my life. I chuckled to myself when I realized that I had extra pie filling after substituting a pre-made pie crust for a homemade one. little individual “love the ones your with”...and I promised to myself to hug them tight. Sending much love and many prayers, not to mention 8 second hugs to Jennie and her girls. Jennifer in her pain reminded us all of how to stop and smell the peanut butter. 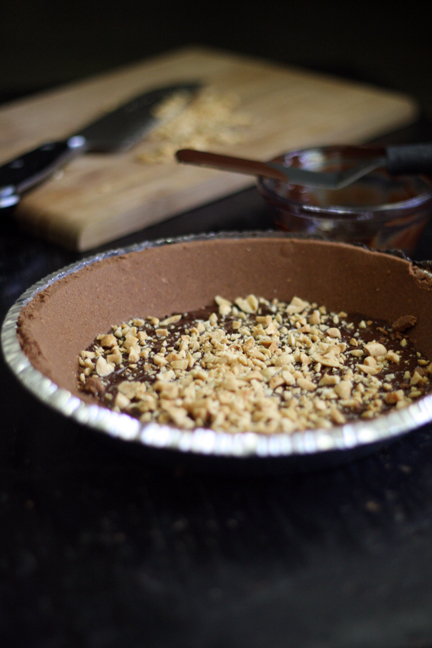 I too used a pre-made graham cracker crust and didn’t know why I had so much extra filling. This is because it was my first pie I ever made. Just beautiful, Wendy. Life is not perfection. It’s intention. Big hugs and lots of love to you and yours! Your warts are beautiful. I’m sending you lots of hugs, friend! Moved me to tears. How I could just read your blog all day Wendy. I love how you phrase things. How you are raw and vulnerable yet bold and faithful. You are a blessing. I love this, Wendy. What a beautiful tribute. What a lovely, lovely post … in every way. That was just so touching and beautiful. My SIL us still struggling with suddenly losing her husband last year so I can imagine Jennie’s pain in mirror of my SIL’s. She and her family are in my thoughts. Amazing. Beautiful. Perfect. Your words and pie. Imperfections and all. Love that. Beautiful post. I’m taken back at how many of us all over the world have come together to support Jennie and hopefully remember to slow down and really spend time with those we love. How sweet that you had three little bowls of filling for your three! Interesting how your changes created something special for your three, almost like it was meant to be. The making of “a pie for Mikey” was so much more about the love shared while making it, while thinking of how much Mikey loved it and about how much Jennie and the girls loved Mikey. Feeling that love and sharing that love simply creates more love. Beautiful post. I love your post and your thought process when making this beautiful tribute pie. It made me think, when you chose to ignore the *sticky irritation* and focused on the beauty, how it manifested itself into a smooth and silky over-flowing expression of love. This is so beautiful. I picked peanuts out of a can of mixed nuts 🙂 It’s all about the intention, and I’m so happy to be a part of this community with you! YES!!! IT’S NOT ABOUT PERFECTION!!!! it’s about love, about connecting, about appreciating, about cherishing, about savoring . . . about the people in our lives . . . luv you friend! This sound so wonderful! I would love to make this and go hide and the closet and eat it!! But I can not make it is to risky with my daughter’s allergies! Maybe I can find a babysitter! Sounds wonderful!! Thanks for sharing!! “warts and all”…I love it. What an awesome #pieformikey post! It’s such a small world. I got to Jennie’s blog from a link on a blog by a lady who lives in Manilla. I read the post about the peanut butter pie and cried. Praying for your friend and her family. Thanks for posting it . This is a beautiful post and a reminder we need all too often. Thank you for it. And for having such a loving, open heart. Isn’t the internet such a gift?